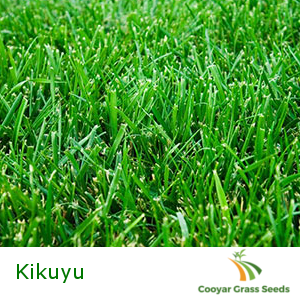 Kikuyu is a Perennial grass with an extensive root system. Through this system the grass spreads (sometimes in excess of 3m) and grows up to 30cm – 40cm high. With regular cutting it forms a dense turf which is ideal for residential use, but the grass is also commonly used in pasture fields. Grows best with high fertility soils such as loam and red basalt, but will go fine in most sandy soils as long as they’re well fertilised. Our clan is bigger then most, with 3 kids, 4 dogs and 2 cats we needed a bigger place so we moved into our new home on the NSW East Coast. Well boy! Didn’t the yard become a mess. The nice new turf that was put down just before we moved in quickly became a dirt patch. Rather then wasting the money getting it re-turfed we thought we’d try growing the grass ourselves. We went down to Bunnings where they told us to try using kikuyu. So we bought a couple of boxes but it ended up being a combination of rye and kikuyu. From what I’ve been told, Rye is good to start with but not so good with lots of use. So we needed to buy a package which was all Kikuyu. Bunnings and Mitre 10 don’t sell it, which is when we went online and found a couple stores that did! To be honest we picked Cooyar because it was the cheapest, but to order it was easy, shipping was free and I have a front lawn again. Happy Mum! !